Recently, I put a spotlight on using the all-time volume weighted average price (ATVWAP) to evaluate, whether the price of Bitcoin is overbought or oversold (find the detailed article here: Bitcoin ATVWAP). It is basically an average daily price, with every price point being weighted by its daily trading volume. The ATVWAP is not limited to BTC though, it also offers interesting insights for the price of other cryptocurrencies. In this article, it will be applied to one of the fastest cryptocurrencies around, which is Nano. As we can see, Nano was traded in many different price ranges over the past two years. It is therefore difficult to determine a “fair” price, that is significant but also not too complicated to calculate. An average price of Nano over time wouldn’t be significant since its trading volume peaked above a dollar, even though Nano traded below 10 cents for a long time. Instead of the average price, I suggest using the all-time volume weighted average price (ATVWAP), which weights each daily price with the volume it was traded at. The following chart shows both the daily price movement and the corresponding ATVWAP value. During its nearly 2 years of public trading, Nano mostly went up in 2017 and mostly went down in 2018. Starting in March 2017, Nano’s price increased steadily from 0.008 USD to 0.09 USD in the beginning of November 2017, growing by around one percent a day for half a year. The all-time volume weighted average price (ATVWAP) acted as a reliable support during that period, with Nano’s price approaching the ATVWAP on several occasions, but barely going below. From November onwards, Nano pumped massively from 9 cents up to 37 USD in a span of two months, growing on average by 10 percent per day (!). That huge growth in price led to an increase of the ATVWAP as well, but it didn’t go nearly as high as the daily price. 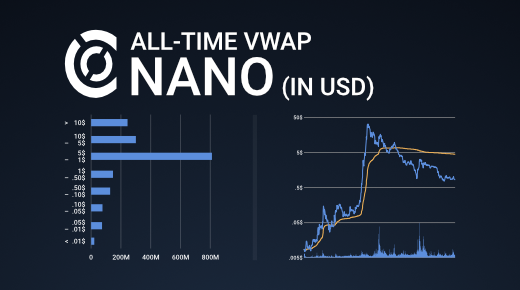 When Nano hit its all-time high of 37.62 USD on January 2, 2018 the ATVWAP was at 1.37 USD, indicating that Nano was massively overbought. The daily price declined after that, but managed to stay above the ATVWAP until March 27, 2018, with the daily price at 6.66 USD and the ATVWAP at 6.8 USD. From mid-March to mid-May 2018 Nano’s price hovered around the ATVWAP but declined below it afterwards. On August 14, 2018 Nano reached a temporary low of 0.78 USD, with the ATVWAP at 6 USD. Nano went up afterwards, but only to a temporary high of 3.72 USD 12 days later. After that, Nano continued to go down to a low of 0.74 USD on December 15, 2018 and has therefore now stayed below the ATVWAP for over eight months, leading to the ATVWAP declining to 4.5 USD. For the last 76 days Nano has stayed below/around the one USD mark. With a price around 80 cents today, Nano is trading way below its current ATVWAP of 4.5 USD. It shows, that many investors are sitting at a loss and might have little to no incentive to sell at these prices. However, the ATVWAP is an adaptive metric and will go lower, the longer Nano’s price stays below the ATVWAP. Adding to that, investors that buy at these prices are in profit, if the price goes back up to two USD or higher. Therefore, it might take some time until Nano’s price hits the ATVWAP again but buying far below the ATVWAP value should be a way better entry point than buying it while the daily price traded 30x above its ATVWAP value.